Scrapper Mechanism Self Cleaning Filters are widely used for continuous filtration requirement without any replacement of Filter Consumables and without Exposure of operators. 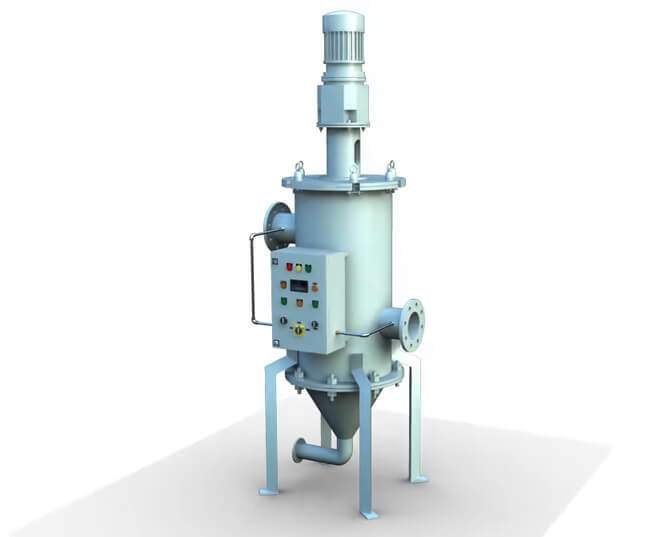 Like auto backwash filter, Scrapper Mechanism Self Cleaning is used for preliminary filtration following the same principle of differential pressure; the only difference is that it is used for applications where back washing medium is not available. In other words, Scrapper Mechanism Self Cleaning Filter is used where in one cannot introduce any additional substance for back washing. The medium to be cleaned is guided into the filter by inlet, which passes from inside to outside through the cartridge gap. After filtration, the filtered fluid exits the filter housing from the top, opposite to the inlet connection and the bigger solids are separated on the surface of the triangular cartridge wires. When it runs for a certain time, the cartridge gap gets plugged up by impurities and meanwhile the differential pressure reaches its pre-set value. Then PLC inspects the signal and sends out the indication. The gear motor drives the scraper and the particles or agglomerates are skimmed from the surface, thereby keeping the function of cartridge well and keeping the cartridge gap clean. When the impurities at the bottom of the filter increases, the drain valve opens up and the impurities are emptied successfully, which makes the system pressure achieve normality. Because of well-set position and optimum scraping angle, the rotational scraper drains off the impurities from the filter with the help of the gear motor. This avoids the burden of taking apart the cartridge and washing it, which results into successful filtration of the medium. The scraper system contains stator, PTFE scraper and spring, which are designed for automatic cleaning, and especially for the reasonable spring pressure, maximally reducing the cartridge’s abrasion. 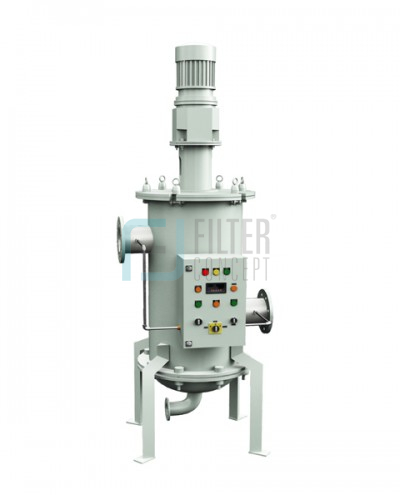 Scrapper mechanism type self-cleaning filter is constructed of filter housings, filter elements, drain valve, and PLC controller. Filter housings can be offered in various materials of construction such as various grades of stainless steel, carbon steel and alloy metal. Filter elements can be offered with wedge wire, sintered multi-layer wire mesh, plain wire mesh and sintered metal powder configuration. They are selected based on the requirement of filtration quality. For 100 microns and more, normally it is recommended to use wedge wire element. From 2 microns to 100 microns, it is advisable to use sintered multi-layer wire mesh and plain wire mesh, depending upon the application requirement. In addition, it has a scrapper mechanism which is operated by a geared motor. Customers can use pneumatically or electrically operated butterfly valve or ball valve as per their process requirement. Normally our systems are equipped with pneumatically operated solenoid valves for back washing and draining. Control panels can be offered with FLP (flame proof) and non-FLP, depending upon the process requirement. Because of automatic continuous on-line filtration, the filtration process becomes smooth. The gear motor runs against the spring actuated scraper and the concentrated solids are drained off by the system, thereby keeping the function of the cartridge well. PLC control function means differential-pressure cleaning, scheduling of cleaning process and manual cleaning. The differential-pressure is an important parameter for operation and can be connected with the central control room. Validated by practice, this filtration process is highly effective and using the wedge cartridge, it can be easily cleaned with less abrasion.